Wright's first became involved with MI5 in 1949 when he was working for the from the Marconi Company, where his father was chief engineer. Ultimately, he was taken on as their first professional scientist in 1955. 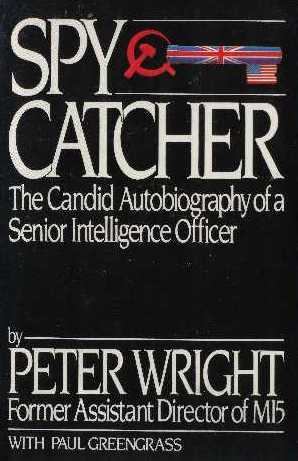 Accordingly, Spycatcher is a mine of information about the technical details of espionage and counter-espionage during the early Cold War as well as the culture of MI5. Wright sums up his early years in the service with the reflection: "For five years we bugged and burgled our way across London at the State's behest, while pompous bowler-hatted civil servants in Whitehall pretended to look the other way." However, Wright increasingly came to feel that many technically well-excuted operations were mysterious failures, and began to suspect that there was a mole within the service. All was not well in British intelligence during this period as a result of the gradual discovery of the Cambridge spy ring. The defections of Guy Burgess and Donald Maclean in 1951, of Kim Philby in 1963, and the (officially secret) confession of Anthony Blunt in 1964, all contributed to a climate of paranoia. This was compounded by tales of penetration from a series of Soviet defectors, notably Anatoli Golitsin, whose claims of a 'ring of five' spies had helped to expose Philby and Blunt. Wright was increasingly drawn away from scientific matters into the world of counter-intelligence. Along with Arthur Martin, he became part of a counter--intelligence team that was characterised by some MI5 officers as an internal 'gestapo'. Wright had strong backing from the CIA's counter-intelligence chief, James Angleton, a former Philby protege who had become increasingly influenced (as Wright was) by Golitsin's theories of widespread Soviet penetration and disinformation. Wright's investigation of the 1930s acquaintances of the Cambridge spies took him into the heart of the British establishment. Three of those under investigation died during this period, two of them committing suicide. Within MI5, counter-intelligence officers investigated a Deputy Director General Graham Mitchell, and future Director General Michael Hanley. However, Wright's ultimate belief was that the mole was the Director General himself, Roger Hollis. Hollis was eventually interrogated during the tenure of his successor, Martin Furnival Jones, and the case was closed. Years later, Margaret Thatcher would announce that an Inquiry by the Cabinet Secretary Burke Trend had cleared him. 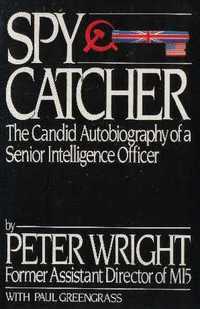 Wright's failed attempt to prove that there was a high-level Soviet mole in MI5, and that it was Hollis, is the core of the Spycatcher narrative. Yet some of the most interesting material in the book is reserved for the final pages following the ultimate failure of the molehunt. This includes Wright's excursus to Northern Ireland, during which he recommended tapping phones in the Republic and booby-trapping the IRA's detonators. Most significantly, however, it includes Wright's account of the Wilson plot. MI5 were always suspicious of Wilson because of his links with East-West business interests. This suspicion was compounded by Golitsin's claim that the KGB had intended to assasinate a leading European politician in order to put their man in place. Some in Western intelligence identified this claim with the sudden death of Wilson's predecessor Hugh Gaitskell. Following Wilson's election in 1964, Angleton alleged to MI5 that the new Prime Minister was a Soviet agent. In 1974, when Wilson was re-elected as head of a minority government, a number of MI5 officers wanted to leak the file on him to the press and sympathetic MPs. Wright minimises his own role in the episode, a detail which has not generally been believed. Eventually, Wilson got wind of the plotting and raised the matter with the head of MI6, Maurice Oldfield, who questioned Wright about the matter over dinner. It has been suggested by Robin Ramsay and Stephen Dorril that it was Oldfield who, some years later, instigated the writing of Spycatcher in an act of revenge against MI5, which had outed him as a homosexual in a power struggle over Northern Ireland. The book may not be completely trustworthy, but it is a valuable historical document which rocked the British state to its foundations on its publication. It is also a cracking read. Wright is well-served by his ghost-writer Paul Greengrass, and much of the story is after all the raw material which former MI6 officer John le Carré drew on for his novels.